Friday Update: Last day of the Spring Break at the Pool. Today we are showing “The Incredibles” at 2 pm. We have popcorn, snacks, and punch! Thursday Update: Today is the Double Header! We are showing “Zootopia” at 2 pm and “Madagascar” at 4 pm! Enjoy popcorn, snacks, and punch. Float around on our giant Toucan or friendly Dolphins! Wednesday Update: We are showing “How to Train your Dragon 2”! Did we mention we have popcorn, snacks, and punch? Watch the snow falling outside while floating in our warm pool! Tuesday Update: A resident brought “Sherman and Mr. Peabody” for everyone to watch, and we have a nice crowd in the pool, come join the fun. Monday Update: The inflatables are already in the water, including the new giant Toucan! Monday we are showing “Despicable Me” starting at 2 pm. 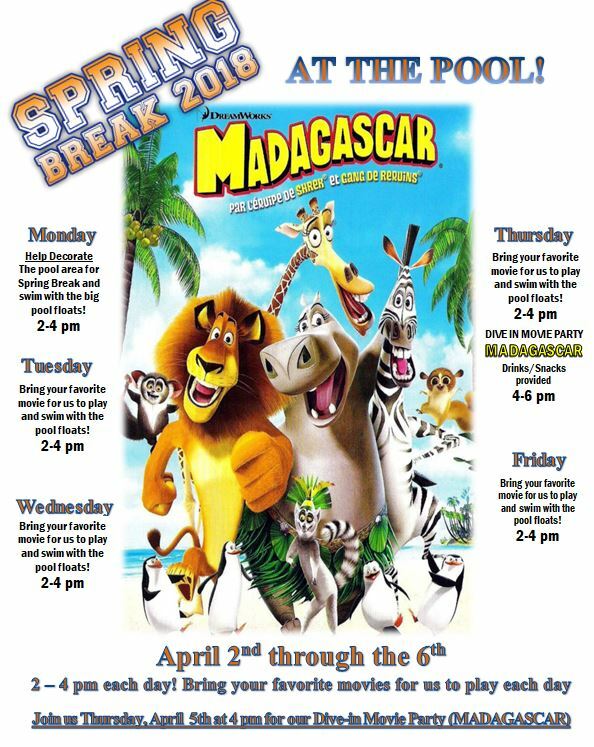 Come to the Greenwood Village indoor pool between April 2nd and 6th for “Spring Break at the Pool.” We will be showing your favorite movies each day between 2-4 pm, bring one for us to play! On Thursday, April 5th we will also be showing Madagascar from 4 to 6 pm. Popcorn and drinks will be provided each day along with pool floats.